The Rising Step Load™ (Incremental Step Load) test (RSL/ISL) combines the best parts of various testing approaches to produce a meaningful test parameter in the shortest amount of time. RSL is similar to a slow strain rate tensile test however, the load is incrementally increased and sustained long enough to detect hydrogen induced cracking. This innovation allows for only one specimen, often Charpy sized, to be used to measure threshold stress, as opposed to the dozens that are required to perform sustained load run-out tests. "...When you can measure what you are speaking about, and express it in numbers, you know something about it; but when you cannot measure it, when you cannot express it in numbers, your knowledge is of a meager and unsatisfactory kind..."
Traditional Threshold stress tests often last 200 plus hours and require numerous large test samples, tested with machinery with a large footprint on the lab floor. On top of all that the results are a qualitative pass/fail, giving little information to work with. With the Rising Step Load™ innovation, a threshold stress can be accurately measured, usually in 24-60 hours, by testing one to three Charpy sized sample saving the owner time, and money plus it produces a quantitative numerical threshold differentiating between infinite life and finite life. This testing procedure has been incorporated into numerous Standards including ASTM F519-97 "Standard Test Method for Mechanical Hydrogen Embrittlement Evaluation of Plating Processes and Service Environments", ASTM F1940-99 "System for Process Control Verification to Prevent Hydrogen Embrittlement in Plated or Coasted Fasteners", and is described in detail in ASTM F1624 "Standard Test Method for Measurement of Hydrogen Embrittlement in Steel by Incremental Loading Technique." 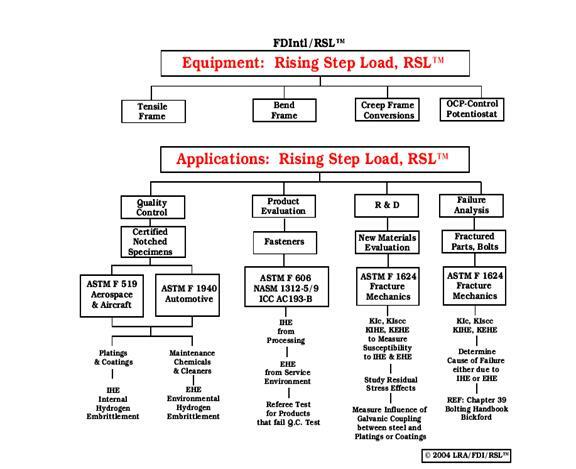 The following flow charts show a visual representation of the equipment required for an RSL test, as well as and the various applications.